One t shirt, one pair of shorts, one dress, two pairs of linen trousers, two favourite holiday tops and one cover up/sleep wear. Rolled and ready. Into a packing cube. Undies, socks, swimwear and sarong in another. Add a cardie and into the bag they go. Sandals, travel towel and silk sleeping bag liner tucked around the packing cubes. Add toiletries, hat and bag for the day time. This is my second Healthy Back Bag, with lots of handy compartments and is big enough for an iPad, sunglasses, notebook and pens, all safely tucked away and organised. These will go in hand luggage, also in packing cubes. Minimalist make up as you can see. New on my Kindle is a book by Dave Dean, Hammocks and Hardrives, The Tech Guide for Digital Nomads. I live in hope. Seriously though, Dave was a great help to me when planning my RTW trip and I would suggest if you are serious about travelling and being a digital nomad, he is the man! Same routine for the husband. 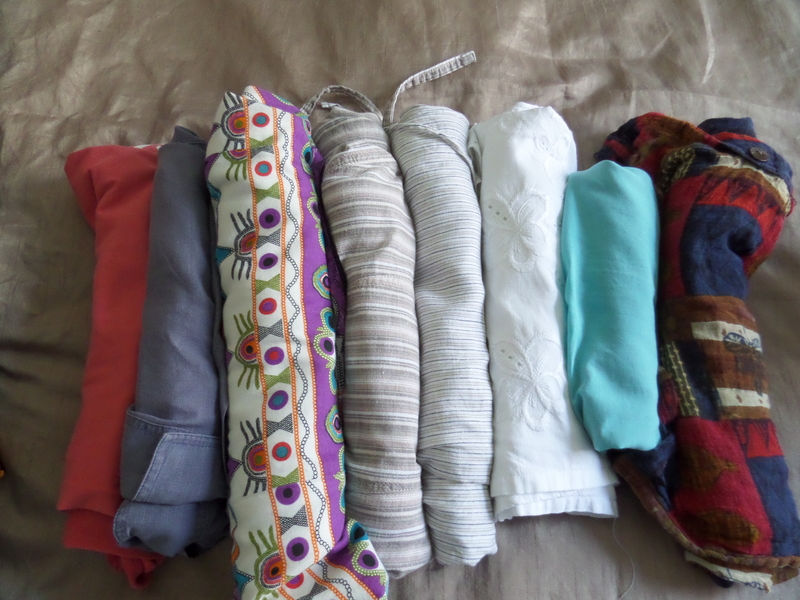 Seven shirts/t shirts, one pair of shorts and one pair of cargo pants, plus sandals, towel and sleeping bag liner. I even managed to get an additional warm top in for us both. Weight of case fully packed? 10 kg each and hand luggage 3 kg each, that is pretty good going I reckon. And if were not for silly Thomson airline rules we could carry this on with us. The only thing we would do different is buy shampoo or shower gel at the airport or destination. Crete, Santorini and who knows where else, here we come. 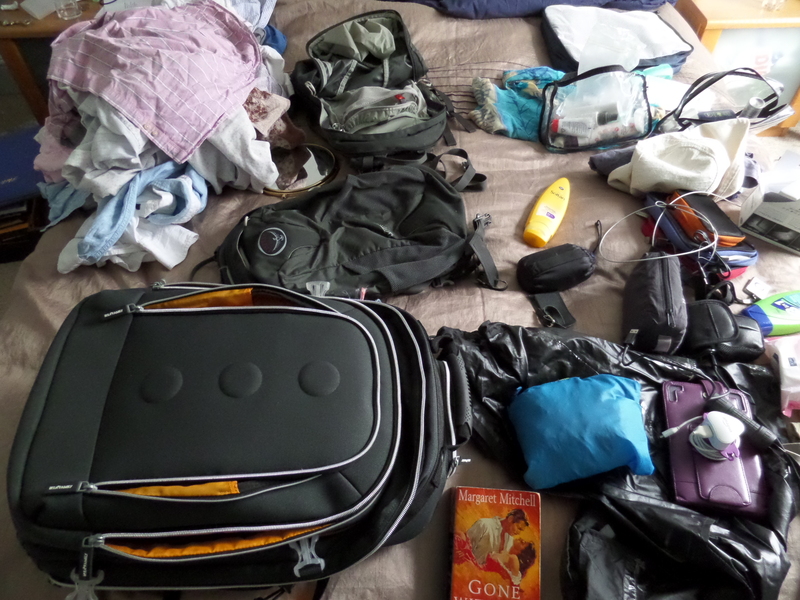 This entry was posted in Europe, Greece, Travel and tagged Crete, Dave Dean, Digital Nomad, Greece, Packing cubes, Packing light, Santorini by Travelling Coral. Bookmark the permalink. Ha! Just discovered I failed to bring correct lead for one of our cameras. Need to add a check list to this post. Before you pack tech check everything has the correct adaptor and cable. And label them all. Or colour code them.